ADLINK Technology, a developer of rugged embedded computing solutions, has released a whitepaper that discusses the importance of High Performance Embedded Computing (HPEC) as Unmanned Ground Vehicles (UGVs) evolve to become fully autonomous and conduct more complicated missions. The evolution of technology standards, COTS and engineering innovation, with specific reference to VITA Technologies solutions. Download the full whitepaper (re-directs to ADLINK’s website). In order to meet the challenges and requirements of fully autonomous UGVs, including adequate payload support, a common, standards-based HPEC architecture must emerge and evolve. This whitepaper raises the issues that need to be considered so that new industry standards can be defined and developed to meet the SWaP requirements for future HPEC systems. 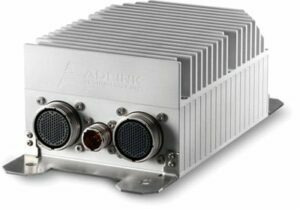 ADLINK Technology provides a wide range of embedded computing products, including Extreme Rugged single board computers (SBCs), COM modules, VPX and VITA-75 systems designed for demanding military platforms such as UGVs.